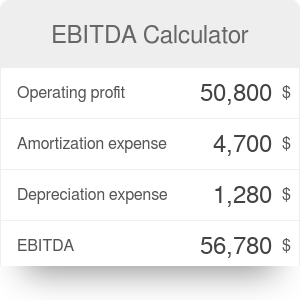 EBITDA calculator is a tool which helps you calculate EBITDA. This is an indicator very similar to EBIT which was created to measure the effectiveness of given company. Want to know more? Keep reading! In this article, you will get to know the EBITDA definition and also find the answer to questions: how to calculate EBITDA and what is EBITDA multiple? Interested? You are at a good place. EBITDA is very similar to EBIT. In simple words, this is the same as EBIT but expanded by amortization and depreciation. The exact EBITDA definition sounds: Earnings Before Interest, Taxes, Depreciation and Amortization. EBITDA is made to measure the operating profit of given company before deduction of interest, taxes and, as we have already written above, deprecation and amortization. EBITDA, similarly to EBIT, is an indicator which makes it possible to rate the real capabilities of companies and also to compare them, even if they operate in different tax system or have different financial strategies. When you look for the information about EBITDA, you might come across EBITDA multiple. It is, to be precise, an another indicator, but it is worth mentioning here, as it is strictly connected with EBITDA. So... what is EBITDA multiple? It is also known as enterprise multiple and is used to determine the value of the company. Thanks to it, investors can pin down if given company is undervalued (it may happen if the ratio is low) or overvalued (it is possible if the ratio is high). To calculate EBITDA multiple we need firstly, as its name indicates, EBITDA and the enterprise value of a company. We hope that this short article has helped you and made you more knowledgeable in the word of business and finance. If you are an entrepreneur or plan to become one in the future, we wish you good luck! EBITDA Calculator can be embedded on your website to enrich the content you wrote and make it easier for your visitors to understand your message.